Attention tourist boards, city councils, and local business owners! 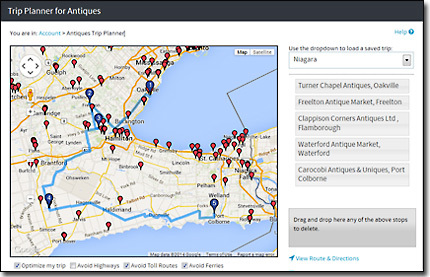 Our popular trip planner helps antiques buyers and collectors plan their road trips. We feature a wide list of antiques stores, markets and dealers across Canada - and are now adding other local points of interests to complete the picture! While collectors create their trip, they can also discover the historical landmarks and places to eat and sleep, complementing their antiquing excursion. From restaurants, hotels, and B&Bs, to museums, galleries, area attractions and points of interest – these are displayed as a marker on the map, so collectors can easily select and add to their route.